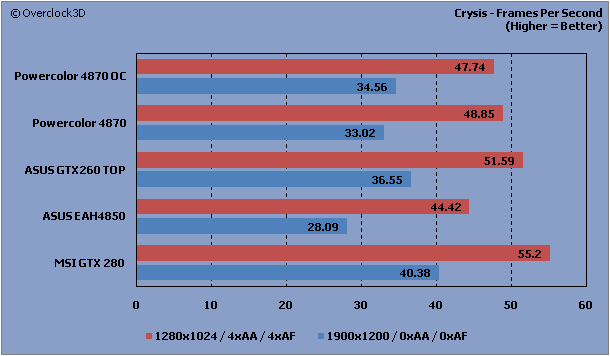 With the GTX260 taking a ~3fps advantage over the 4870 at 1900x1200 and 1280x1024 resolutions, but the lower price of the PowerColor HD4870 giving it a slight advantage on the CPF scale, there really is no clear winner in the Crysis benchmarks. 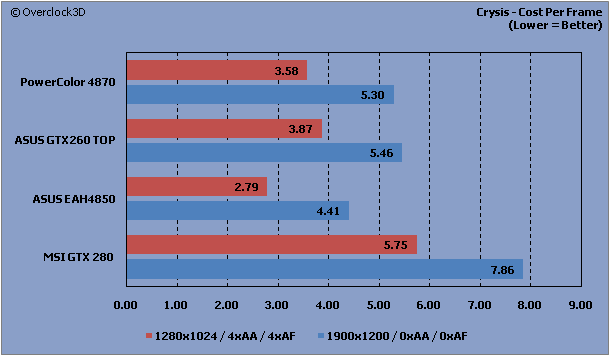 As expected the GTX280 gives the best benchmark results at all resolutions, but with a £7.86 per frame price tag attached to the card, are the extra few fps it produces really worth it? F.E.A.R. is a game based on the Lithtech Jupiter EX engine. It has volumetric lighting, soft shadows, parallax mapping and particle effects. All results were recorded using F.R.A.P.S, with a total of 5 identical runs through the same area of the game. The highest and lowest results were then removed, with an average being calculated from the remaining 3 results. 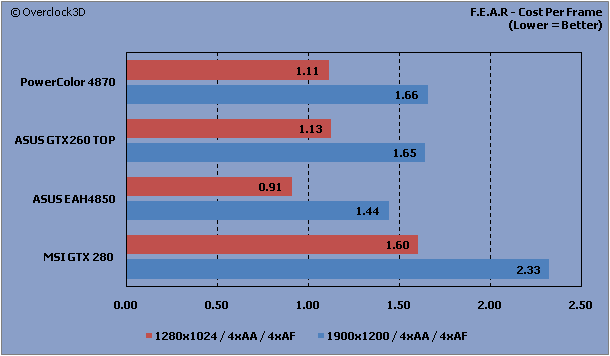 Once again the HD4870 can't quite keep up with the GTX260, falling 16fps behind at 1900x1200 and 19fps behind at 1280x1024. 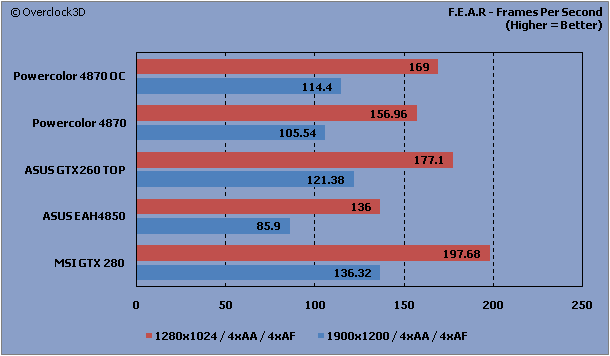 Even when running at overclocked settings the 4870 can't quite manage to close the gap, leaving both the GTX260 and 4870 with almost even scores on the CPF scale.